Liquid polish in an 8oz. bottle. 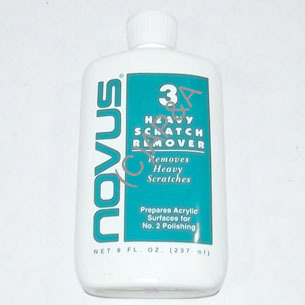 Similar to Novus #2 but a more abrasive compound which is recommended for cleaning/polishing of very dirty or scuffed areas on your game's playfield, or for buffing-out heavier scuffs/scratches on plastic parts. Follow-up your Novus #3 polishing with Novus #2 to do a final polish, then add a coat of wax for added protection and shine. Safe for use on clearcoated or non-clearcoated playfields, Mylar, and all plastic parts.